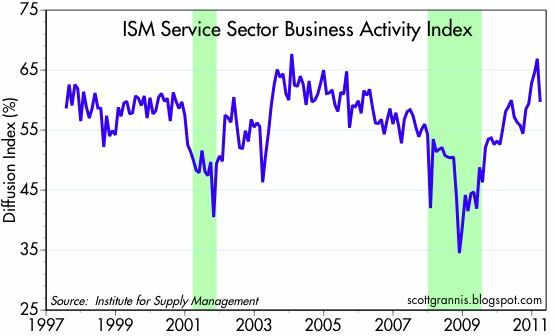 The March ISM service sector indices fell more than expected, but remain at levels that are consistent with continued economic growth. 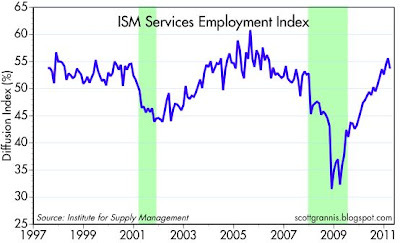 The employment index also fell, but only modestly. 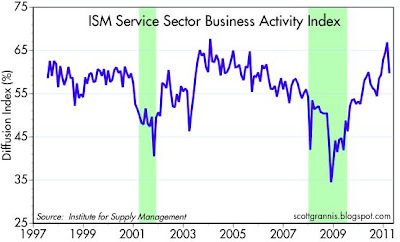 It continues to signal ongoing economic growth. 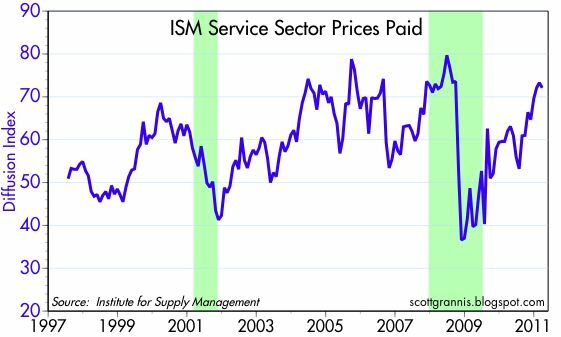 The prices paid index fell modestly, and is still quite high from an historical perspective. One theme that is repeated often these days—and here—is that inflationary pressures persist even though the economy is well below its full-employment capacity. This directly contradicts the widely-held Phillips Curve theory of inflation, which holds that high levels of unemployment exert downward pressure on prices and thus keep inflation low. The Fed should be looking at numbers such as this and concluding that there is no longer any need for quantitative easing, and that in fact it is past due time to begin raising short-term interest rates. That they aren't is one good reason why the dollar is trading at or near all-time lows and the equity market is trading far below levels that could be considered fully-valued. Too much monetary stimulus is not a good thing, just as too much government spending (disguised as stimulus) is not a good thing. The private sector could be a lot healthier (more confident and more willing to invest in new jobs) if our government were to reduce monetary policy risk and reduce its consumption of a sizable portion of the economy's resources.